Until Earth gets its tropics under control, it seems there’s always going to be another untapped area with a lost treasure to be found. In Jungle Ascent from 5th Street Games it’s the stockpile of the legendary Oobiedoobies. They’ve left their fabled stash atop the Cliff of Frab, and now that an expedition has found its hiding place the members have reconsidered this whole “cooperation” thing. The magical power conferred by these goods can only go to one person so now it’s a race to the top. The object of the game is to reach the treasure-laden top of the mountain map first. 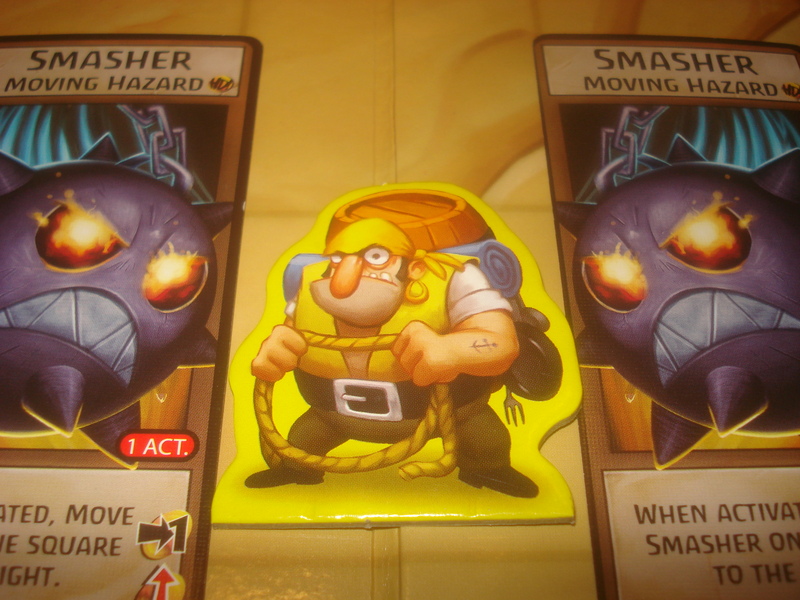 Two to four intrepid adventurers start with a hand of cards, a cardboard standup, and a Hazard token. 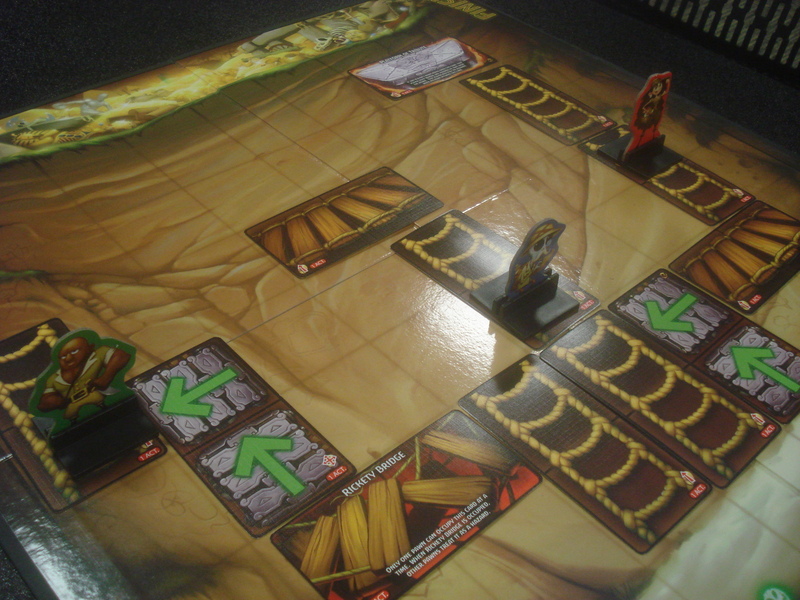 The action plays out on a board with a simple grid. At the bottom are starting spaces from which our heroes begin their journey and at the top, riches beyond imagining. The trick is to fill in all those intervening squares with something people can clamber about on. "Oh, you take the high road and I'll take the low road..."
On a player’s turn, he gets two actions to play or draw cards or move his pawn. 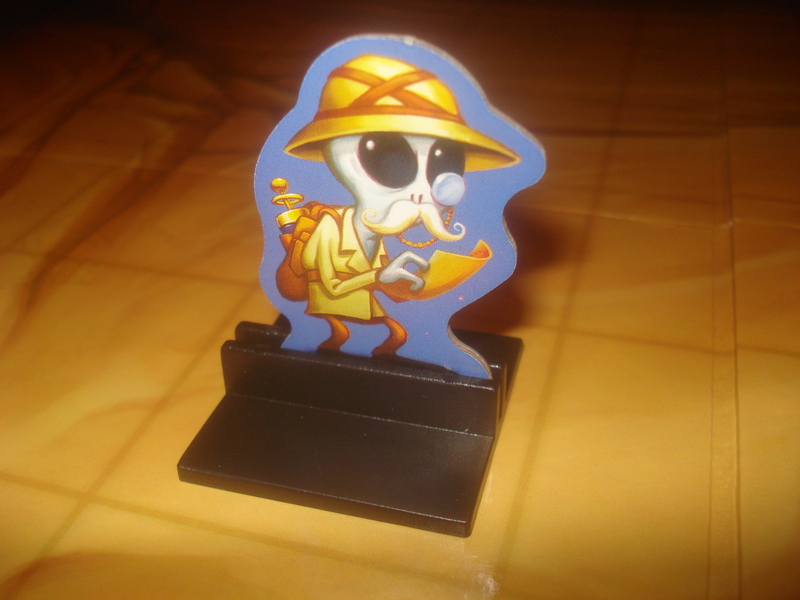 With nowhere to go when the game opens – nothing’s been discovered yet – the explorers place cards anywhere on the board, preferably to their advantage, to form “Pathway Squares.” The cards are elongated rectangles big enough to cover two board spaces. Once there’s a Rope Ladder or Bridge, someone can move onto it. A red arrow indicates a card’s orientation on the cliffside when laying that component, though some have multiple arrows allowing the player to decide placement. Not everything is just a climbable catwalk: Rickety Bridges hold only a single occupant while Conveyor Belts push and pull adventurers along. If an arrangement “conveys” a pawn off the precipice he may land on a lower platform (“Our hero”) or fall all the way to the bottom. Time to start climbing again . . . Anyone who’s ever seen an Indiana Jones movie knows ancient temple builders aren’t going to make this easy, though; there are Hazards like Fireballs and Golems as well. These are placed like Pathways but most of them move. A black arrow shows how it rolls up, across, or around the board, and anyone it intersects gets knocked off his perch. Some Hazards burn or blow up the cards they come across, others just squat in the way and force explorers to circumnavigate them. Not all advantages lie with the cliff, however; Effect and Interrupt cards like Rocket Shoes and Moving Walls level the playing field. These may offer an adventurer another action, a bonus move, a card steal, and more. When someone finally outmaneuvers both the long-dead tribal engineers and the other players and stands upon the top row, he wins. This is a tightly packed box (it’s actually a little bit hard to open) and its components are nicely done. The deck is an interesting set of colorful and elongated cards, and they shuffle beautifully. The pictures are amusing and the rules seem pretty clear, though some cards are marked for cooperative play or added challenges and those symbols ought to be a tad larger. Speaking of which: The list of components in no way reflects the contents, claiming inaccurate card counts (too many in one case and too few in another). The board is plain but utile, though having the top row of squares half-covered by the treasure’s illustration is a small nuisance – one the rulebook illustration clears up but it would be nice if new players didn’t have to ask. The cardboard tokens and standees are also colorful and thick, yet this is one of the game’s failings. Pawns can occupy the same space but the plastic stands are so oversized they almost cover a whole grid square . . . then they must be dismantled to fit the box. Do this every time the game is played and the wear and tear shows. A good size for tiny hands to grasp, though. Jungle Ascent is clearly intended for kids, from the bright hues and colorful cartoon-like characters to the short playing time, but it’s entertaining enough it doesn’t take much to convince adults to join. It’s barely two steps up from Candy Land as far as ease of use, but the strategy quietly demands more of kids when they aren’t looking. Before they know it they’re learning and by then it’s too late – they’re gamers. Play starts within a couple minutes of cracking the seal and lives up to its 25-minute promise. For some it’s actually too short: The fun ramps up, a Hazard is about to flatten some poor schmoe, and someone steps past him to victory by Grapple-Hooking over what was thought an impassable obstacle. But such unpredictability is part and parcel. Even adventurers a single step from the top may as well be on the bottom for all the assurance they have of a win. 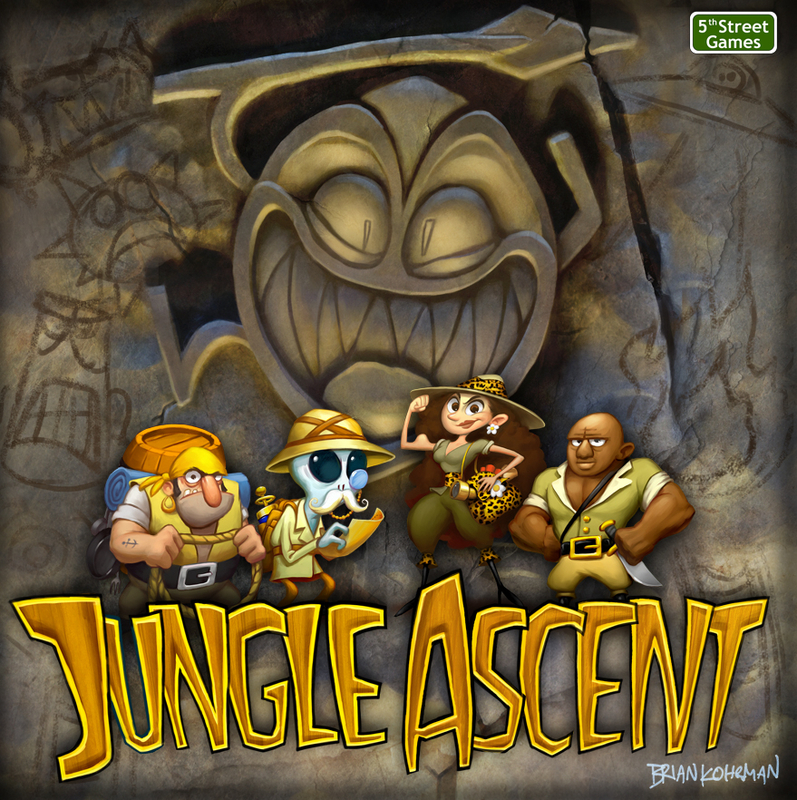 A rarer find than tropical treasures, Jungle Ascent is that family-friendly item in need of no handicapping (if the little ones aren’t feeling competitive there’s a cooperative scenario, and a solitaire version if they don’t want to play at all). It’s too brief to interrupt bathtime (Mom’s or the kids’), and doesn’t condescend to anyone. It runs better with four players – once everyone’s dodging four hazards at a time the fun really starts – but no matter the group size Jungle Ascent is still a tight race from start to finish. Thanks for the review! I’m glad you are having fun with Jungle Ascent!